What Would William Morris Think? On the Digitization of his Wallpaper. During his life, the writer, designer, and social activist William Morris struggled with a basic conflict between his livelihood and his liberal beliefs. A staunch socialist, Morris believed art should be made with care and craftsmanship, and that work should be an essential, joyful part of life, instead of an obligation. However, because Morris insisted that all of the designs from his company, Morris & Co., be created with the utmost attentiveness, the company’s output – textiles, furniture, stained glass, illustrations, wallpapers – were of an exceptionally high quality and highly sought after, which was reflected in their prices. As a result, his business relied on the patronage of the upper classes, meaning that even as he personally opposed the stratification of society, his works served as a status symbol for the wealthy. Morris never fully resolved this basic tension, but as a progressive thinker and futurist, he likely would have been excited about Historic New England’s new project to digitize 6,000 samples of wallpaper from the past 300 years, including over 30 of his own designs. The collection includes unused and immaculate samples, scraps salvaged from the walls of old New England homes, scenic panels, scrapbooks and even papers used to line trunks or fireboards. Along with historical commentary, Historic New England provides incredibly high quality scans and photographs of each of the artifacts. If you zoom in closely you can see the places where the colors are slightly offset, where some were applied too heavily and began to bead, and even where inks were tested on the paper’s crinkled edges. With older or damaged wallpapers, you can see the tiniest tears and even the stippled texture of the paper itself. Incredibly beautiful, informative, and available for free to anyone with internet, Historic New England is democratizing the access to these incredible works of art and design, an undertaking Morris surely would have supported. 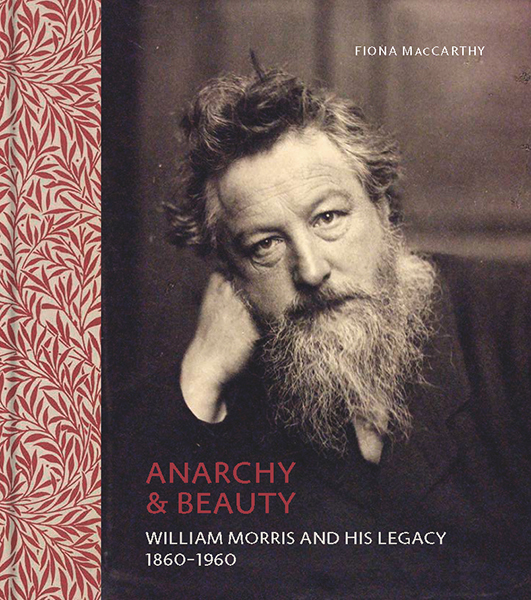 For more about Morris’s life and works, look to Anarchy and Beauty, the new book by Fiona MacCarthy, who explores Morris’ artistic and social endeavors and the friction between the two.